This page contains generic information about various topics that might be interesting while developing for the Crazyflie Python client. The same kind of information is available here for the Crazyflie Python API. It uses the SDL2 to read input devices on Windows/Mac OSX and raw jsdevs on Linux. It also supports custom input from LeapMotion and ZMQ. The architecture for the input devices in the client strives to give as much flexibility as possible and to make cross platform compatibility smooth. It combines raw readings from input devices with input device mappings to create control values for the Crazyflie and the application. It's also possible to input control values directly. 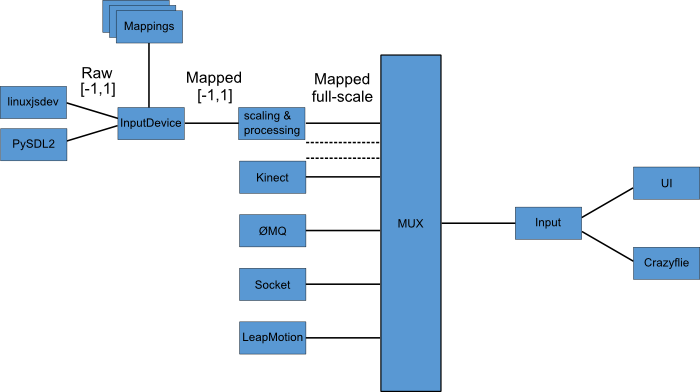 Below is a walk though of every step of the process, from reading the device to sending the control values to the Crazyflie. There are two ways to get input into the client: Input readers and input interfaces. On startup the modules lib/cfclient/utils/inputreaders and lib/cfclient/utils/inputinterfaces are initialized and these directories are scanned for implementations that can be used. Each python file in these directories represent a “backend” that handles input. Each backend can have zero, one or multiple devices that it can control. The inputreaders module is used to read normal joysticks/gamepads while the inputinterfaces module is used to read any custom interface that's not a joystick/gamepad. Once the backends are found the client tries to initialize each backend. If successful it is scanned for devices, otherwise it's quietly discarded (only printing a message to the console). A structure is build where the dependency is reversed (backend→device to device→backend) and a list of devices (with connected backends) is passed on. The client can now open any device in the list and read it. If the device is from the inputreaders module a mapping has to be supplied as described below. Currently there's two types of inputreaders: SDL2 and Linux. The Linux backend is used on Linux and SDL2 on all other platforms. In order to use the devices connected to the backend a mapping has to be supplied to translate the raw axis/buttons indexes (0, 1, 2..) to usable values (roll/pitch/yaw/thrust..). The input interfaces don't use any mapping, the devices itself directly generate useful values (like roll/pitch/yaw/thrust). Currently there's two implementations: LeapMotion and ZMQ. Values are read the same way as from normal gamepads/joysticks, at 100Hz. For more information on how the ZMQ interface works read here. To support the application there's a number of files around it, such as configuration and caching. All these use JSON to store information. All of the user configuration files are stored in the /conf directory. Most of the files have default versions in the /lib/configs directory that are either copied at the first start up or used in parallel as read-only copies to complement what ever is stored in the user configuration directory. To save the configuration between runs of the application there's a configuration file (/conf/config.json).The file is updated while the application runs and settings change. Below is an example of the configuration file. "Microsoft X-Box 360 pad": "xbox360_mode1_linux"
The source code contains a default configuration file (/lib/cfclient/configs/config.json). The file contains two parts: The default writable part and the default read-only part. When the application is started for the first time (and /conf/ doesn't exists) the writable part of this configuration file is copied to the /conf/config.json file to create the default values. The read-only part is used for settings that cannot be changed, but shouldn't be hardcoded in the code. When the application starts and both the user config in /conf/config.json and the read-only part of /lib/cfclient/configs/config.json is merged so they can all be accessed in the application. In order to speed up the connection procedure for the Crazyflie the TOCs are cached (more info on logging/parameter frameworks and TOC). The writable part of the TOC cache is located in /conf/cache where each cache is saved in a file named after the CRC32 (in hex) of the TOC CRC32 (for example 1CB41680.json). There's also a read-only part of the TOC cache that's located in /lib/cglib/cache and contains the caches for official builds. When the application connects to a Crazyflie the CRC32 of the log and param TOC is requested. When the client receives it will check if a file with the correct name exists (in both the RW and the RO TOC cache). If it does it will load the cached TOC, if not it will start requesting the TOC from the Crazyflie and when it's done it will save it in the cache. The TOC cache files are organized in a hierarchical manner after the group.name concept. In the examples below you first see the group acc which contains the variables y,x,z,zw and mag2. Each of these variables have a set of attributes that are described below. Input device configurations are used to map raw axis (integers) to values such as roll/pitch/yaw/thrust (more info above). The configurations are stored in /conf/input, one file for each configuration. The default configurations are stored in /lib/cfclient/configs. The first time the configuration starts up (if /conf/input doesn't exist) the default configurations are copied into this directory and can then be used. A raw axis can be mapped to one or more values, that way it's possible to split up values on multiple axis. An example of this is using the bumper buttons to control the yaw, where the left one controls CW rotation and the right one controls CCW rotation. The user can configure custom logging configurations from the UI (more information on logging/parameter frameworks). These will be saved in the /conf/log directory, one file for each configuration. Default logging configurations are stored in the /lib/cfclient/configs/log and are copied into the user configuration directory on the first status (if /conf/log doesn't exist).